A few tools are available to help you work with several Yandex.Direct campaigns at once. 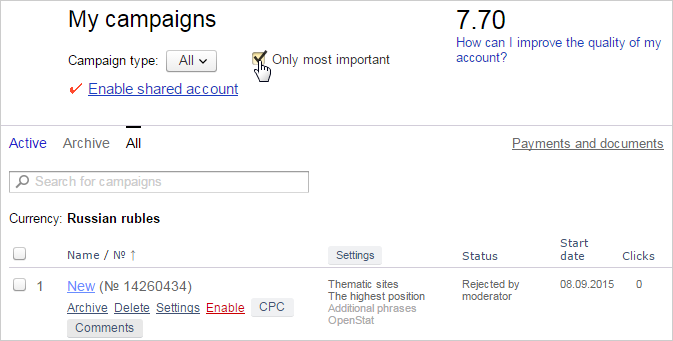 You can use the Search Campaigns feature if more than one campaign is linked to your username. Search by campaign name and number, start date, comment text, and (if the campaign is serviced by a Yandex manager) manager name. To make changes to a number of campaigns simultaneously, firstly tick the boxes next to the relevant campaigns in the My campaigns section. A list of possible options will appear at the bottom of the page. Select the required option then click Apply. The list will only include options that can be applied to at least one campaign. If the required option is not available for some of the campaigns, a warning message will be displayed. Note that copying campaigns preserves the keywords, negative keywords, ad texts, all settings, bids set, bid adjustments, and vCard information. The CTR and other statistics start from zero after impressions begin for copied campaigns. Please indicate the campaigns in which you need to add, edit or delete tags from the Yandex.Metrica service. Choose Edit Metrica tag in the list of actions. In the window that opens, enter the number of tags and click Add. If as a result there ends up being more than five tags to that campaign, then those tags will not be added to that campaign. New tags will not be added to a smart banner campaign. In the window that opens, enter the number of tags and click Replace. All tags in the selected campaigns will be replaced with the ones indicated in the field. In smart banner campaigns, the Metrica tag will be replaced with the first one from the list. Click the Delete all tags button. All tags in the selected campaigns (except smart banner campaigns) will be deleted. You cannot delete the tag in smart banner campaigns. You can create a separate list for the campaigns that you work with most often. To do this you need to enable the Add campaign to most important option in the Advanced settings section on the campaign settings page or use the appropriate batch operation. A link will then appear on the My campaigns page that you can use to switch between viewing all your campaigns and just your “most important” ones. The most important campaigns list differentiates between each login, it can therefore be used to visually separate one representative's campaign from another.